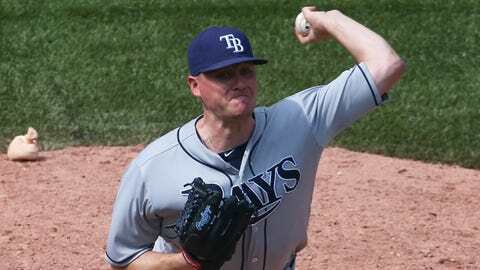 Jake McGee has a 2.77 ERA in six major-league seasons. I don’t much care for the move the Rockies made Thursday. I like Jake McGee just fine — he’s an excellent late-inning reliever — and maybe I could understand the trade under different circumstances. But the Rockies don’t actually project to be good, so it seems strange for them to add a reliever at the cost of an affordable, long-term outfielder. Not only that, but of the two prospects exchanged, I like Kevin Padlo more than German Marquez, and Padlo is joining Corey Dickerson in going from Colorado to Tampa Bay. The trade won’t be the end of the world, and the Rockies could just decide to flip McGee in a matter of months, but for now, it’s an odd decision. This is a move you might expect from a competitive team with a thin bullpen, not a mediocre team with a thin bullpen. So the Rays add value to the roster and to the farm, and the Rockies add late-inning impact. That’s essentially the summary, with one interesting offshoot being that this seems to set the Rays up for another outfielder trade. There’s another interesting offshoot, though, and it has to do with the Rockies, and with where they play. Sometimes it can be an easy thing to forget about, but the Rockies play baseball literally a mile above sea level, and that makes the team something of an ongoing experiment. It’s always fun to have an opportunity to investigate a new Coors Field question, and the McGee acquisition opens the door. Let me give you a quick overview of what you already know. In the table below, you’ll see what the Rockies have been dealing with. In case you aren’t familiar, wOBA is a measure of offense, built to resemble OBP. Higher is better, and so on and so forth. Here’s a decade of home-road splits. On average, throughout baseball, hitters are more successful at home, and pitchers are more successful at home. Now look at the Rockies numbers. Their hitters have been way better at home, of course. The pitchers have been worse, relative to their own performances elsewhere. This is easy to explain: Coors Field is hitter-friendly, on account of the altitude. This is basic stuff, and there are real questions about how Rockies hitters adjust when they go on road trips. The McGee trade has nothing to do with that, but it does get you wondering about Rockies pitchers, and how they can survive home games. If the Rockies want to further leverage their home environment, they need to find pitchers who can succeed despite the elevation and the outfield expanse. You’ve heard all the talk about how pitches move differently in Denver. It’s not just an urban legend, and it makes pitchers feel like secondary stuff is less effective. With this in mind, there’s something fascinating about McGee. As the excellent Mike Petriello noted, McGee leans heavily on his fastball. Maybe that doesn’t convey the point well enough. In that case, try this: last year, almost 600 pitchers threw at least 10 innings. McGee posted the single highest fastball rate — by more than two percentage points — at 93%. Almost 19 of every 20 McGee pitches were fastballs, and this has been consistent throughout his career. The Rockies are getting a fastball reliever, whose secondary pitch is more of the fastball. So, the big question: How have fastball pitchers fared in Colorado? Have they enjoyed any relative advantage over non-fastball pitchers? In the top group, you have pitchers who threw their fastballs an average of 72% of the time. That’s some pretty heavy fastball usage, and these pitchers managed an average home-road split of +.004 wOBA points. In other words, they allowed a home wOBA four points higher than their road wOBA. In the last group — the 55% fastball group — they showed an average split of +.033 wOBA points. That’s significantly larger, and the middle group also fits into the pattern. Nothing about this is conclusive, but it does very much support the idea that fastball pitchers have something of an immunity to Coors Field. They still get hurt, because balls fly and there’s a lot of space in the outfield, but they’ve been hurt less than other pitcher types. And I think it makes sense, logically, because fastballs don’t rely on movement quite as much as other pitches. It’s possible there’s just a lower rate of fastball mistakes in Colorado, and the table would back that up. And, you know, that top group has an average 72% fastball rate. Jake McGee is coming off a 93% fastball rate. There’s some chance he’ll like Colorado just fine. This could also apply to Jason Motte, who last year threw 84% fastballs. Now, in fairness, Motte wasn’t good, but it’s rare to find a talented free-agent pitcher willing to sign with Colorado, and the Rockies got one who might survive the park. It’s an interesting potential angle, even if we’re still talking about two relievers on a team that might well finish in last place. I want to make a few things clear. The information above isn’t proof of anything. It’s suggestive, but it’s not conclusive, and it’s not like there’s only one way to cut it in Colorado. For example, Jorge de la Rosa has managed in Coors Field just fine despite throwing a lot of his secondary stuff. Maybe these characteristics for McGee and Motte are just a coincidence. Maybe they weren’t acquired for their fastballs, and it’s worth noting that last year the Rockies pitching staff actually had its lowest fastball rate on record. If anything, last year the team avoided the fastball, which is notable. Could be the Rockies are reversing course. Could be anything. The Rockies have long been a little inscrutable. There’s just something neat here, though. Could be, fastball-heavy pitchers are better equipped to handle Coors Field. There’s evidence in the numbers, and it makes a certain amount of logical sense. The Rockies, of late, haven’t been an awful lot of fun to watch. But their situation is always fascinating to think about.